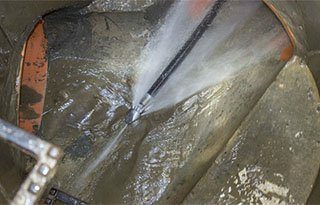 When a build-up of grease, silt, leaves, hair or other foreign object is causing a blockage, jet blasting is the answer. In most cases, jet blasting removes the blockage, allowing water and waste to flow smoothly again. At Plumbing Central Sydney, we use powerful hydro jetting machines to ensure all blockages are completely cleared in no time at all. Pipe blockage can come in all shapes and sizes. If your water is not flowing properly, it might be time for jet blasting. How Does Jet Blasting Work? Traditional methods of unclogging pipes and drains won’t be able to tackle tough tree roots or mineral deposits causing plumbing issues, but a jet blaster will pulverise these blockages quickly and effectively. Jet blasting scrubs the inside of the pipes using water only, without damaging the pipes. Other chemicals and tools used in traditional methods of unclogging and cleaning can easily cause more damage to the pipes. The pressurised water leaves pipes clean and intact. The streams of water from a jet blaster are powerful enough to blow an adult bison into pieces from a distance of almost 15 feet. This means that even the toughest blockages are no match for a jet blaster. Across Sydney, our team of professional plumbers specialise in jet blasting and all aspects of plumbing. We ever offer a 24 hour emergency service for those emergency plumbing situations. For more information, contact Plumbing Central or phone 0410 011 999 today.